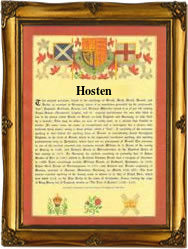 This surname is apparently recorded in England as Hostan, Hosten, Hostin, Hoston, and Hostman. According to the International Genealogical Index (IGI) it may be another variant of the popular surname Austin, also known to be recorded as Aust, Awste, Austen, Austin, Auston and Outin, Outwin and Outwyn. However the IGI also indicates other possible souces such as Aston, Asten, Hastin, Hastings, Houston and Oasten! The make-up of the Hostan/Hosten surname may suggest that it was originally locational from some now "lost" medieval village. Over three thousand British surnames do originate from now lost place, so this is certainly possible, but we have no proof. The surname is first recorded in the surviving church registers of the city of London in 1609, with that of John Hostind as spelt, at St Andrews Holborn on June 4th of that year, and later with that of Susan Hoston at St Dunstans in the East Stepney, on June 24th 1624. Assuming it is a variant of Austin, the origination is the Roman (Latin) name "Augustine", with Austin being its short form and first recorded as a surname in the 13th Century (see below). This was during the Christian revival period, when a religious order known as the Austin Canons was established. The present name is probably habitational in origin, as the order was celibate, and therefore the name refers to people who worked at the various properties owned by the order. As Austin the first recorded spelling of the family name is believed to be that of Henry Austin. This was dated 1275, in the Pipe Rolls of the county of Worcestershire, during the reign of King Edward 1st, 1272 - 1307. Throughout the centuries, surnames in every country have continued to "develop," often leading to astonishing variants of the original spelling.